Apprehension was in the air when I entered Woking New Victoria theatre, I knew that I would know the songs but I was not sure it would take me back to those fun fuelled Disco electric days of the 80’s... well it did sort of! I'm not quite sure why the musical is called Club Tropicana, as apart from the name and a mention of “free cocktails”, there was not a sniff of the fabulous George and Andrew songs of the incredible WHAM. However, I am a lady of a certain age and remember those days whilst a millennium baby would not, so, does that matter? The cast do an admirable job of taking me almost back to the electric 80s but it is not quite the 80’s as I remember, but again does that really matter? I think that the script dictated the songs that were chosen, that’s why there is no Wham, Duran Duran, New Order, Tears for Fear, Human league, Whitney Houston, Madonna etc... because their songs did not tie into the story line. 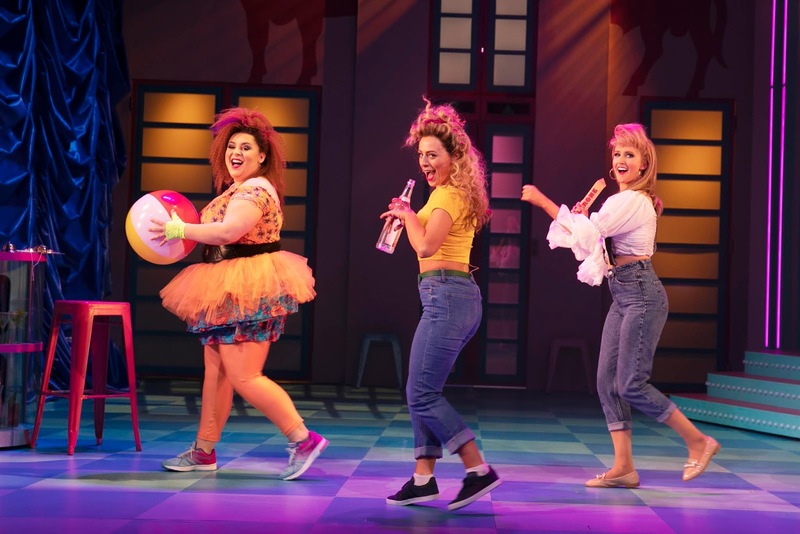 However, the musical depicts so many other things from the 80’s, the costumes for one: Ra Ra skirts, leggings, shorts, dungarees, “statement tee shirts” are a plenty on stage! The hair is big and huge mobile phones make a few appearances. 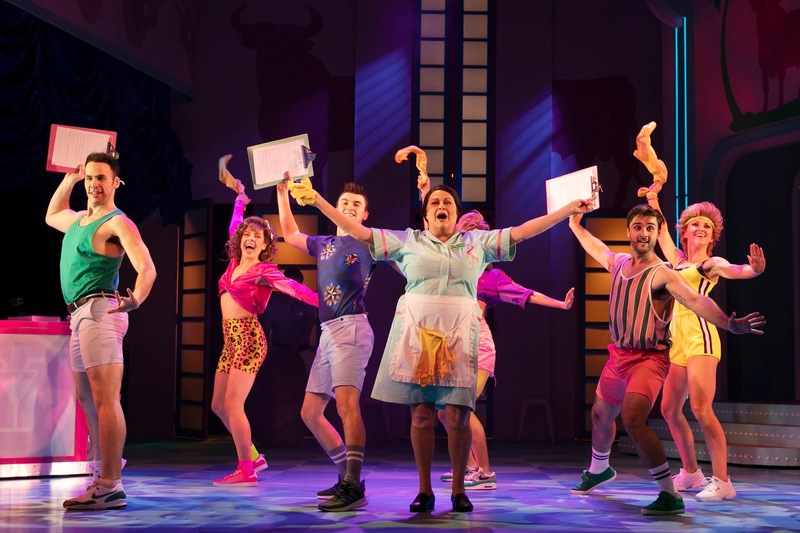 Club Tropicana is a feel-good night of entertainment, delivered by a vibrant, fun, high-energy cast who sing and dance as if their lives depend on it. I was not keen on some of the jokes which are not particularly PC nor the insulting references which border on sexist and homophobic, but I suppose that sums up the 80’s in a way. 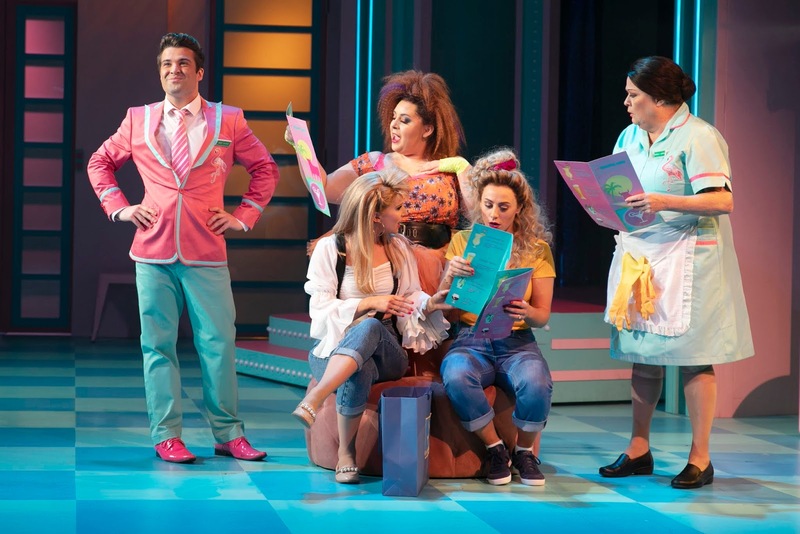 Once Joe McElderry comes onto the stage the show comes along and takes the cast and audience into a flurry of singalong & dance routines– if only I could have got on stage for 'Oops Upside your Head'. Joe has to be applauded for an energetic exuberant performance and for not waning once. He really leads the show and uplifts the rest of the cast. The same can be said, for the formidable and extremely talented Kate Robbins playing Consuela, who magically plays the part. Her comic timing and characterisation are hilarious and her great voice brings a real belly laugh and applause from the audience. Emily Tierney must be complimented for delivering a strong comic performance with a great voice, as the double-crossing hotelier Christine. The voices of Cellen Chugg Jones and Karina Hind the young couple, singing to 'I Could Be So Good For You' are a highlight. There must be mention of Tara Verloop, Rebecca Mendoza and Kane Verrall who all performwonderfully; with Kane working especially well with McElderry as his love interest. Club Tropicana will bring a big smile to your face, give you the feel-good-factor and make you feel young once again. Its not an award worthy musical but is certainly good fun and like a summer pantomime for adults.